The Turkish lira ticked up 6% Tuesday morning after the country’s central bank increased the liquidity of Turkish banks by loosening their reserve requirements. The lira is down 43% against the US dollar this year. Unless President Tayyip Erdogan makes a major U-turn by ordering an increase in central bank interest rates, the lira – and Turkey’s economy – is going nowhere fast. “A number of policy errors have led to Turkey’s current predicament,” Credit Suisse analysts Alexander Redman and Arun Sai told clients recently. It’s “Worse than Argentina,” according to Exotix Capital analysts Stuart Culverhouse and Hasnain Malik, referring to the hyperinflation that crippled that country earlier this year. Argentina is suffering from high inflation and a big budget deficit, brought on in part by the US dollar’s relative strength against the weak peso. The Argentinian central bank has hiked rates to fight its crisis, all the way up to 45%. But “Turkey’s currency crisis seems to be more pronounced than Argentina’s was in April 2018 and has produced the sharpest fall in EM currencies since Donald Trump was elected US President in November 2016,” Culverhouse and Malik say. 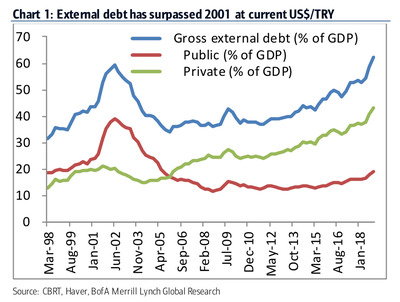 It’s also worse than the recession in Turkey started by the 2001 deficit payments crisis, according to Bank of America Merril Lynch’s Ferhan Salman. 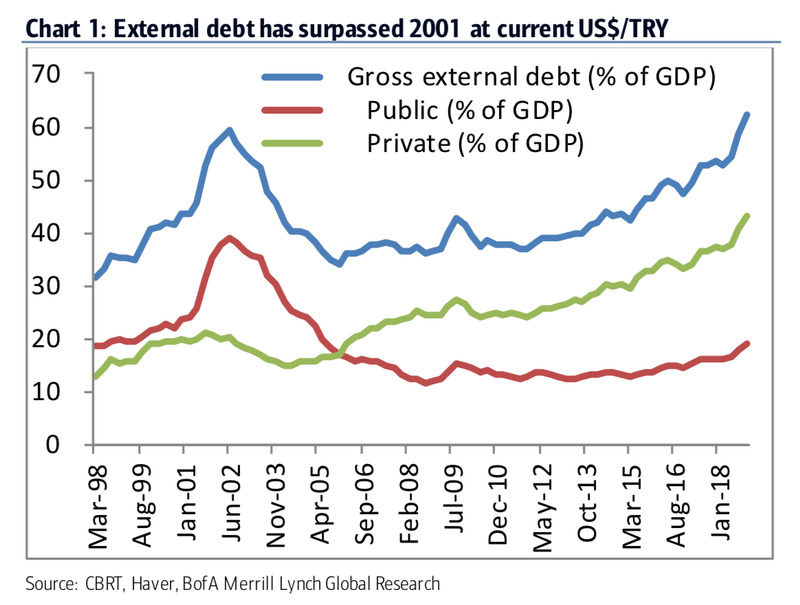 “Gross external debt has reached US$466bn (Mar-2018, about 60% of GDP), surpassing the levels of the 2001 financial crisis. External debt rollover needs in the next 12 months are also high (US$180bn – about 22% of GDP),” he told clients. “We have been here before,” says Russ Mould of AJ Bell, in terms of the 2001 crisis. The immediate trigger for the collapse of the lira was US economic sanctions, mainly on steel and aluminium, imposed by President Donald Trump. But Turkey’s currency – and thus its economy – was especially vulnerable because Erdogan has strongly held beliefs about the function of his central bank that most economists regard as irrational. In Turkey, inflation is currently running at 16%. (By contrast, it’s about 2% in the UK and the US.) The Turkish central bank held its interest rates at 17.75% in July. That spread between the two rates – about 2% – will not be enough to tempt Turks into depositing their cash in Turkish banks, analysts believe. Rather, Turkey needs to hike rates by 5 or 10 percentage points, to something like 25%, in order to create a “real” interest rate on cash above the rate of inflation. Increased cash deposits would shore up the Turkish financial system, reduce the amount of cash in circulation, and bring inflation down. It would also increase the value of the lira, and stabilise Turkey’s economy. The downside, of course, is that a reduction of cash in circulation would also trigger an increase in unemployment, something that Erdogan is no doubt keen to avoid. Yahoo FinanceThe lira has lost more than 70% of its value against the US dollar this year. So analysts are peering back through the archives to gauge the likelihood of Erdogan being persuaded to change his mind. Credit Suisse’s Redmun and Sai found two quotes from Erdogan published in mid-May, in which the president expressed unorthodox views about economics. At a meeting in Chatham House, London, Erdogan told attendees to “please learn” that low interest rates deliver low inflation, according to the Financial Times. He also confirmed that he was going to have a role setting interest rates himself, confirming his central bank’s monetary independence was over. Tilmann Kolb of UBS wrote in a note four days ago that Turkey could be headed into “a full-fledged balance-of-payments crisis.” In plain English, that would mean Turkey’s currency becomes so devalued it becomes unable to pay its debts or buy services from abroad – technical bankruptcy for the entire country.